A wise guy's always right. Even when he's wrong, he's right. Author Andrea Codrington discusses the opening titles for Donnie Brasco, from her 2003 book Kyle Cooper: Monographics. 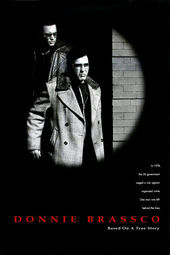 One of the ﬁrst main titles to be done under the Imaginary Forces name, Donnie Brasco is a micro-narrative so moody and evocative that it had one New Yorker critic praising it above the ﬁlm itself. Using a combination of predominantly black-and-white and colour stills shot in surveillance style — complete with Kodak markings and grease-pencil scribblings — Cooper choreographs an unsettling sequence about friendship, betrayal and the implosion of relationships caught in the middle. Accompanied by a delicate piece of music by Beethoven, the gritty still images become animated thanks to a carefully choreographed edit that favours slow fades punctuated by rapid-cut action sequences and the occasional piece of live footage. The titles begin and end with a view of Johnny Depp's dark-ringed eyes looking from outside — an impostor cop in the midst of New York wise guys.